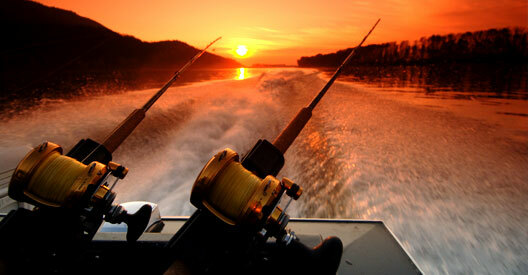 No single fishing trip is ever the same as the one before or the one to follow. This is especially true at Great River Fishing Adventures where we guarantee that your next adventure will be as good as the last. Great River Fishing Adventures’s fleet of 20 custom welded river jet boats ranging from 21′ to 25′ ft have been expertly designed to withstand the various demands of our local rivers. 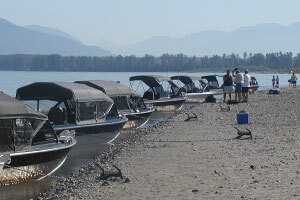 Our boats can run in as little as 2’ft of water and can reach speeds in excess of 45mph. They are truly magnificent river machines. To protect you from the elements each boat boasts a full walk-through windshield and a fully enclosed custom removable top. Although they have sitting available for 5-6 passengers, we recommend that groups stick to 4 anglers/ boat as this provides the most comfortable fit. 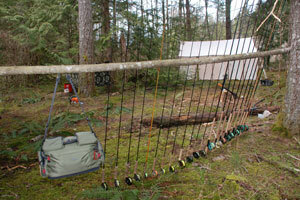 There is also plenty of storage space for your lunches, coolers, and your daily catch. Although we supply all tackle and equipment on our fishing excursions, one is more than welcome to bring their favorite tackle and equipment.